Archives for February 2017 | Khelmart.org | It's all about Sports. 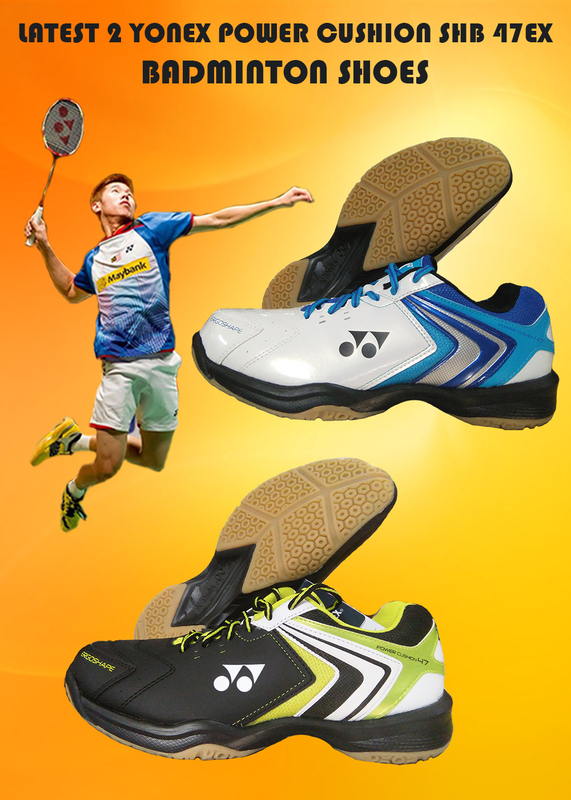 Yonex introduces new Power Cushion series of shoes .i.e. SHB 47 Ex shoe. In this blog we shall explain the different variant available in YONEX POWER CUSHION SHB 47EX model. 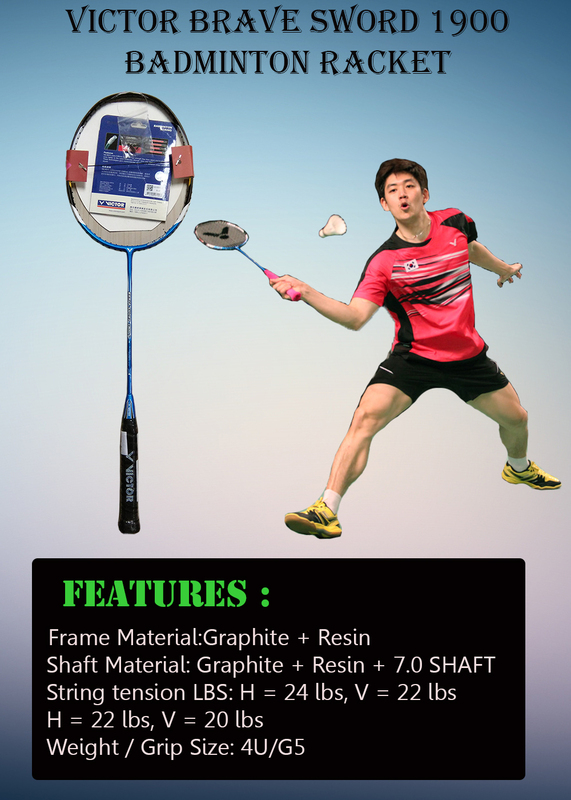 It is a new launched by Yonex in power cushion series. Further , It is equipped with latest 3 Layers power cushion and other state of art shoe technologies. Yonex SHB 47EX Badminton Shoes is designed for professional level players. Yonex SHB 47EX Badminton Shoes is equipped with PU, Leather and Polyester Mesh which will provide you better stability and great fitting. This Yonex SHB 47EX Badminton Shoes base color is Black and on the shoe side the Lime color lining and its innovative design give attractive look on ground. Its flexible outsole is made from rubber which will provide you better stability. Its midsole are equipped with latest EVA (Ethylene-vinyl acetate) technology which will provide you perfect cushioning. Good traction with soft cushioning for the feet and joints. Yonex SHB 47EX Badminton Shoes is designed for professional level players. Yonex SHB 47EX Badminton Shoes is equipped with PU, Leather and Polyester Mesh which will provide you better stability and great fitting. Power Cushion Technology is having 3 times more shock absorbing power as compared with urethane and it is lightweight shock absorption which will provide you better comfort and reverse the impact energy for better footwork movement. 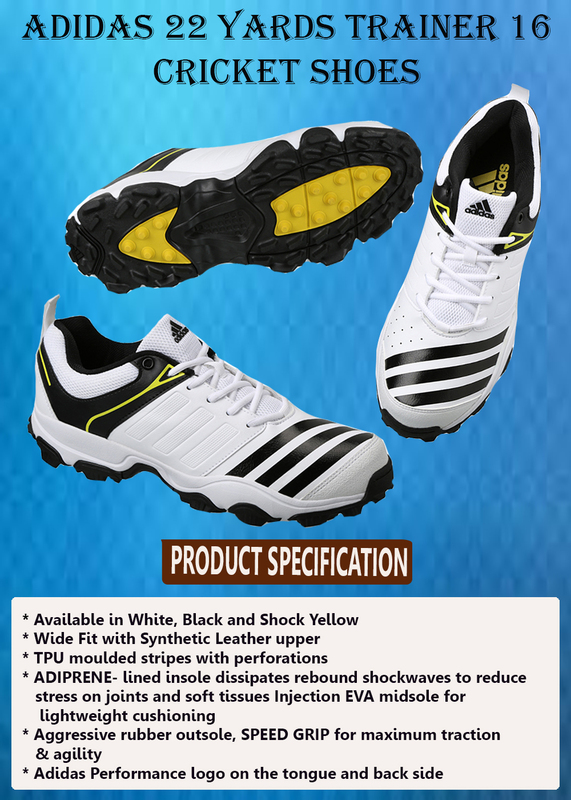 Adidas Cricket Footwear’s are always the first choice Cricket players. Indian Cricket Players Like Virat Kholi , Suresh Raina and many more are using the Adidas latest cricket shoes are footwear’s. Adidas 22 Yards series, Vector Series ,ADIZERO and ADIPOWER are most popular series in Adidas series. 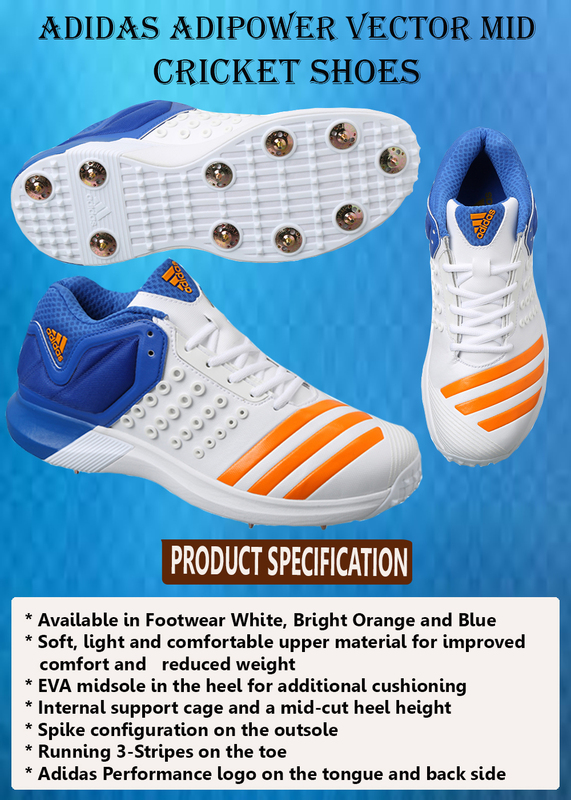 Adidas 22 Yard series are developed for intermediate cricket players. 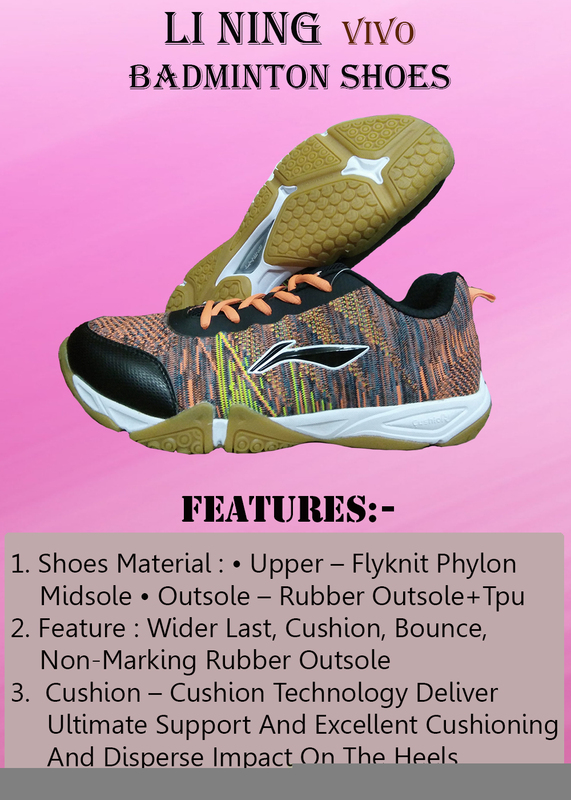 With latest design and material technology, this shoe will provide all new features and comfort for all round type of performance. 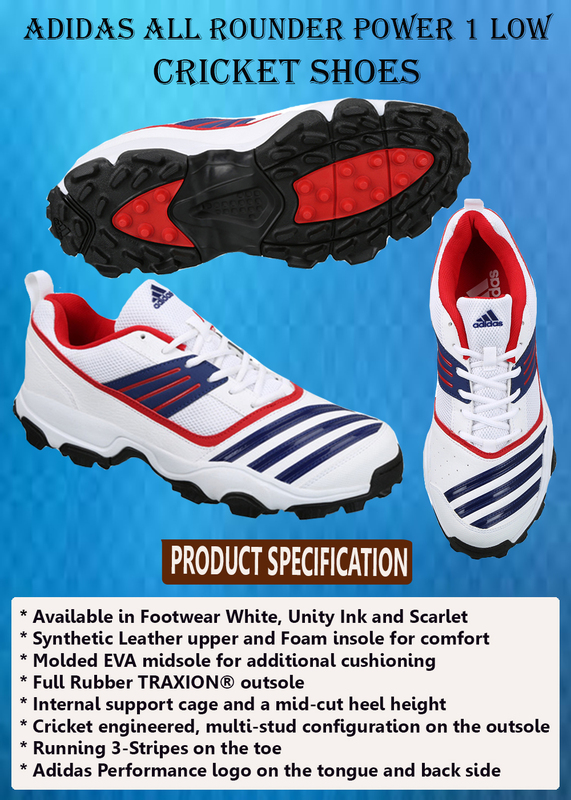 Made from Synthetic leather upper, perforated for ventilation and TPU molded stripes for support & style 22 Yards 16 will provide you perfect blend of durability and comfort. Adidas used Injection EVA midsole which give best in class cushioning effect. With all new features and latest technology and material innovation, Adidas cricket footwear’s are the choice of professional cricket players. 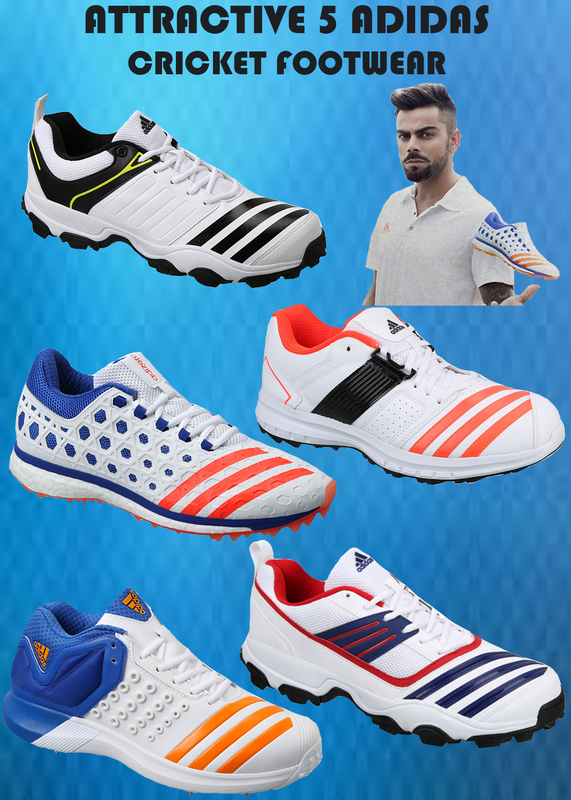 Cricket players can see and explore the full range of Adidas Cricket footwear’s at khelmart.com. 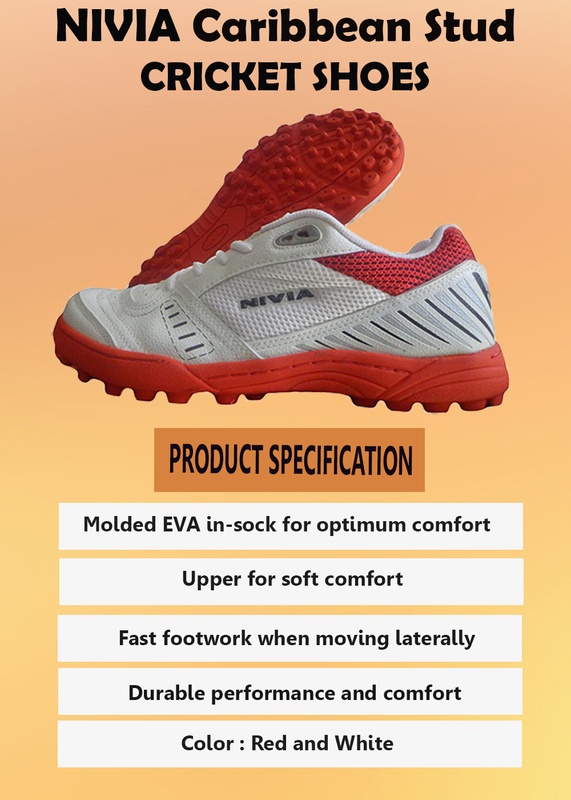 While Adidas and Nike are dominating the sports footwear market but in India Nivia is also emerging as new and innovative player in economical price range (From 700 to 2000 Rs). 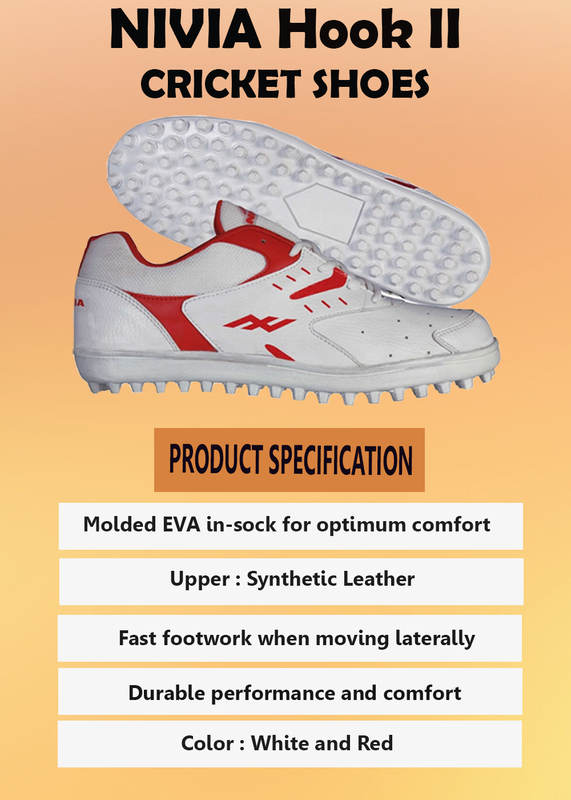 Nivia Cricket shoes are made of high quality material (Upper material is imported PU and durable Air Mesh and Phylon Midsole) which give best options in mid range cricket stud shoes. Nivia Base model starts from Rs 700 and higher model goes to Rs 1800.00. 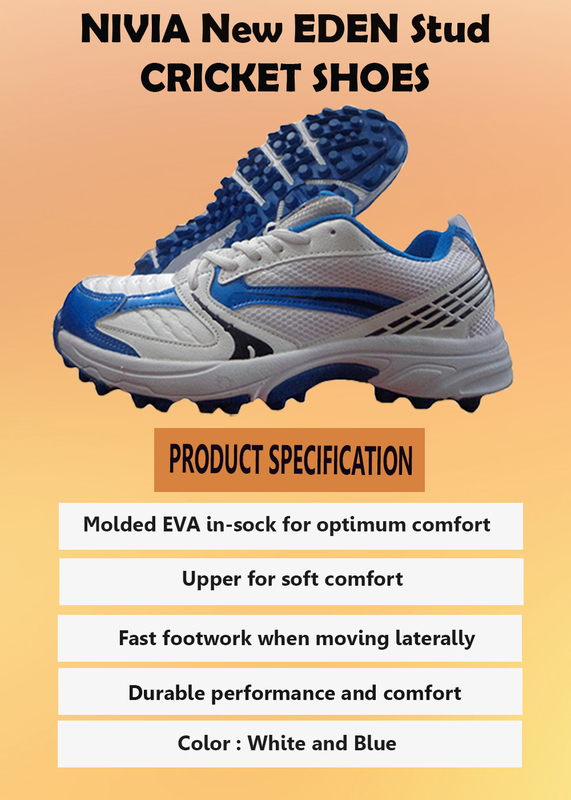 In this blog we shall explain the details of Nivia Cricket Footwears. Nivia New Eden Shoes are upgraded version of conversion model Eden. it is equipped with rubber studs which is designed to give you perfect gripping and traction force. Blue color graphics will suit your playing style. Its supportive forefoot snug comfort concept ensures stability for fast cutting movements, which provides superior cushioning. 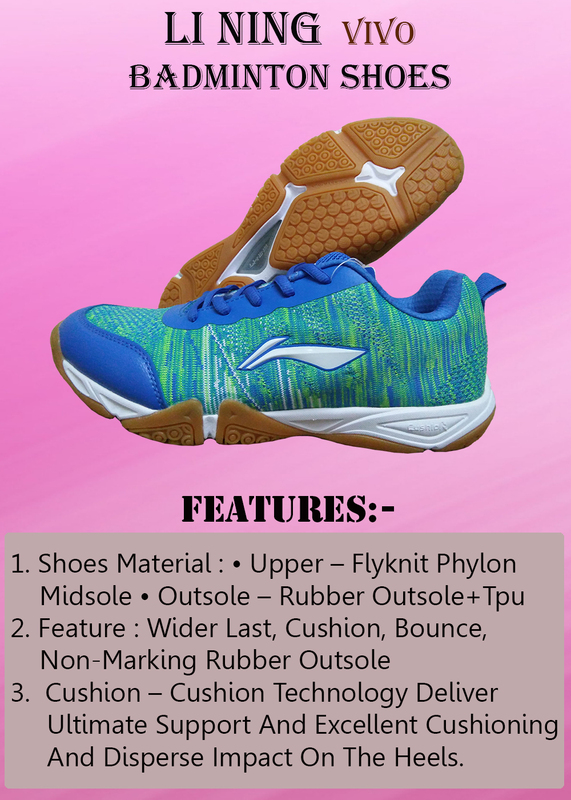 To improve the cushion and comfort , Nivia used phylon midsole for better cushioning. 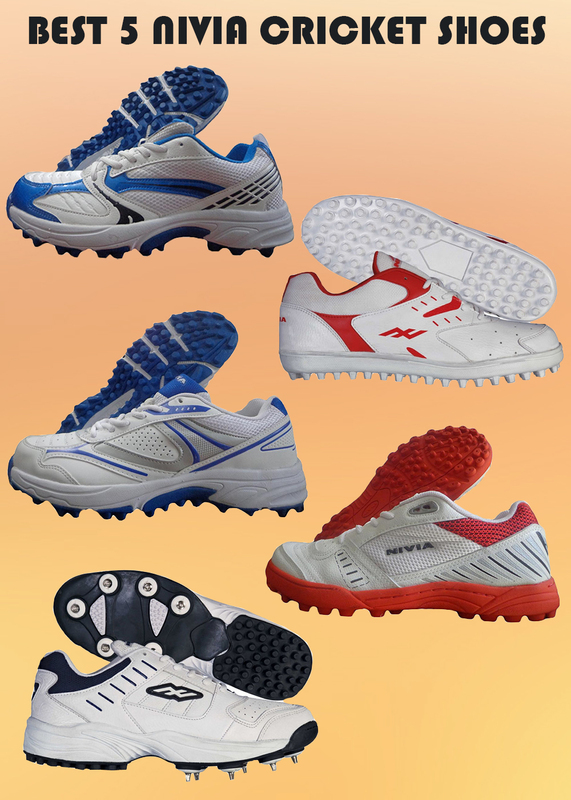 Nivia Lords Cricket Shoes are developed for those player who wants to spent long hrs on crikcet net and on ground. These shoes feature imported phylon midsole and outsole with replaceable spikes at the front that provide good grip over the surface and ensure balance and stability.Its upper is made of synthetic leather and durable mesh which gives superb performance. Nivia Auckland studs are developed young and emerging cricket players . Synthetic leather upper and padded collar for comfort and durability Imported phylon outsole and midsole. Royal Blue color graphics will suit your playing style. Creating an innovative range of shoes which also comes with unmatched designs, Nivia is a brand that excels in catering to the sports needs of the passionate sportsman. 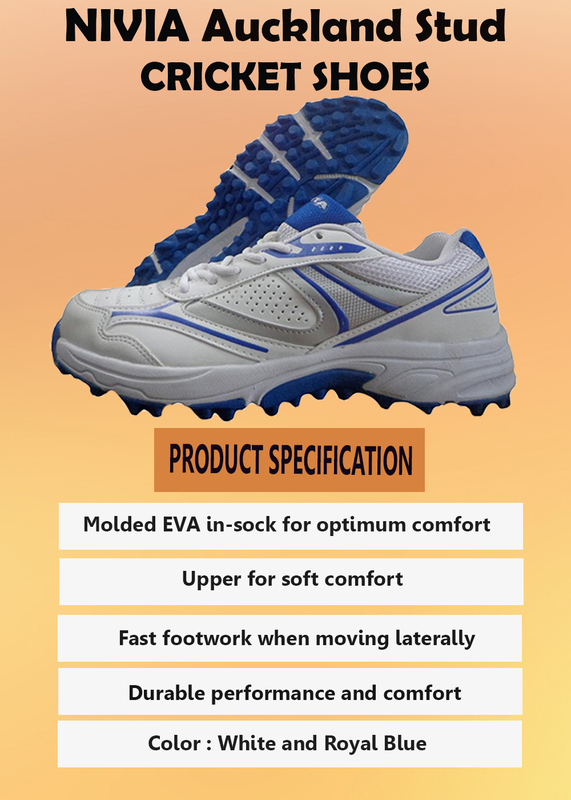 NIVIA Cricket Shoes are made of High Quality Material which will give you comfortable feel. Its high quality rubber spike is designed to give you perfect gripping action and traction force. Red color graphics will suit your playing style. Upper Material- Mesh & Pvc Synthetic Leather and In Sole- Stroble Cloth. This Shoes IDEAL FOR INTERMEDIATE PLAYERS. 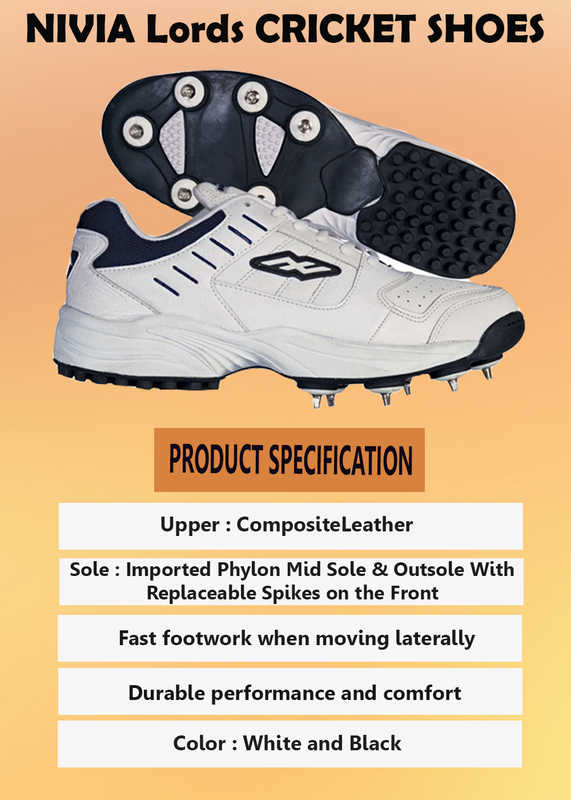 NIVIA Hook II Cricket Shoes is good for intermediate players. Synthetic leather upper and padded collar for comfort and durability Imported phylon outsole and midsole. White color graphics will suit your playing style. 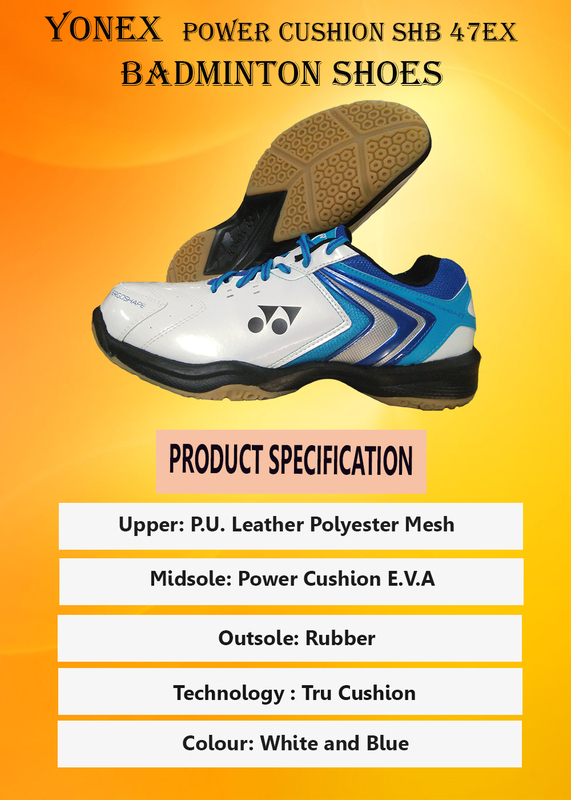 Upper sole synthetic, sole of pvc cup type which offers maximum durability, sole with bud type spiky surface, upper surface with tiny breathing holes, aids comfort of wearing and prevents sweating. Made up of good quality material. YONEX Latest Power Cushion mode SHB 34 Ex is launched now and ready to serve badminton players.This models is developed for advance badminton players and Apart from its innovative design features, this model is manufactured with cutting edge technologies. This models in available in 3 different variants (All Three variants are available on Khelmart.com). First variant in available in Black base color while on top of that Blue color graphics give a different look to shoes. Shoe upper material is PU and advance mesh is provide for proper air circulation for better feel and comfort during long game play. Midsole is made of E.V.A which is a very good shock absorbing material. E.V.A sole along with super power cushion will provide an integrated bur flexible unit. Outer sole material is 100% rubber with unique groves patterns. Base color is White and Orange color Graphics. With white base color , this look very sobor. White base is considered as one of the best color for badminton forwears. Base color is White and Sky Blue color Graphics. 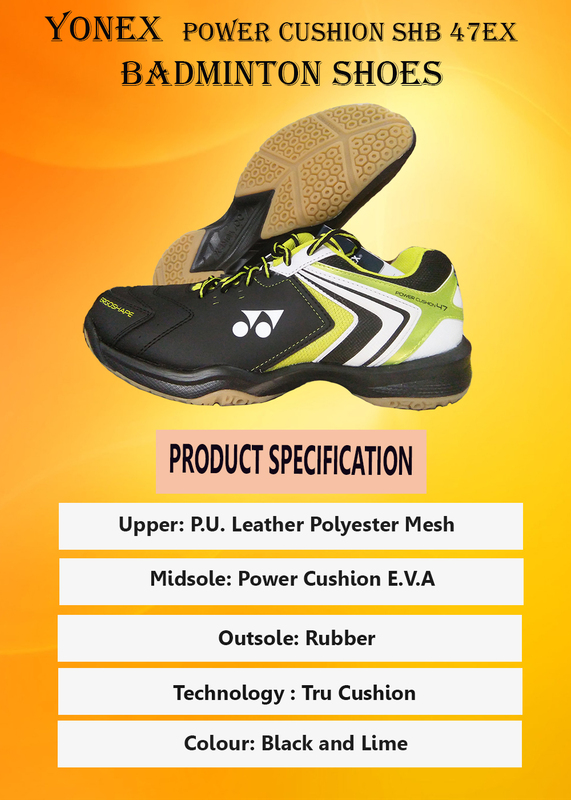 Overall, YONEX POWER CUSHION SHB 35EX is a good and attractive looking shoe with all new and improved features. Players with advance playing skill will definitely get advantage of this shoe and it will complement the player overall performance. Its design and shape with help in proper fitting. Advance super cushion system will help in better comfort and avoid injuries during intense game rallies while unique grip pattern help in better traction force which eventually result into effective court covering. Yonex is one of the most sought after brands for golf, tennis and badminton equipment. 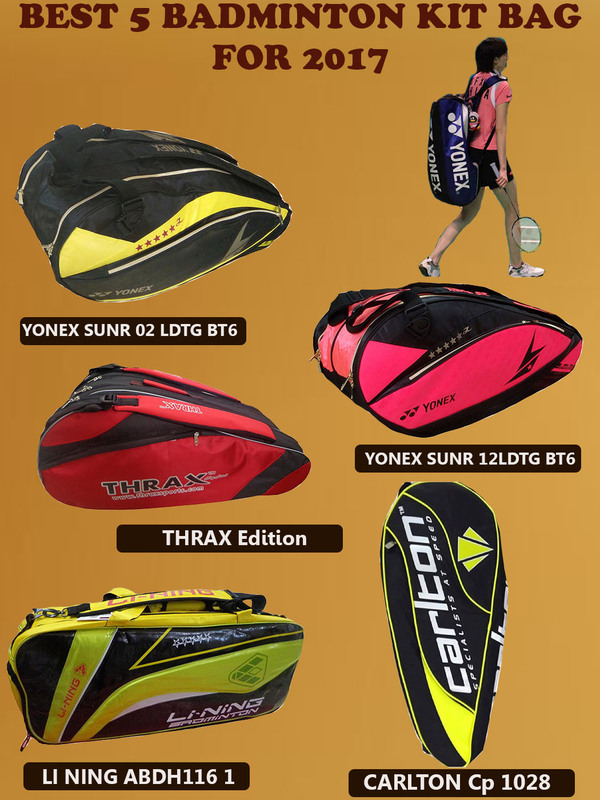 SUNR 02 LDTG by Yonex has adjustable padded straps which allow the bag to be carried easily and comfortable. 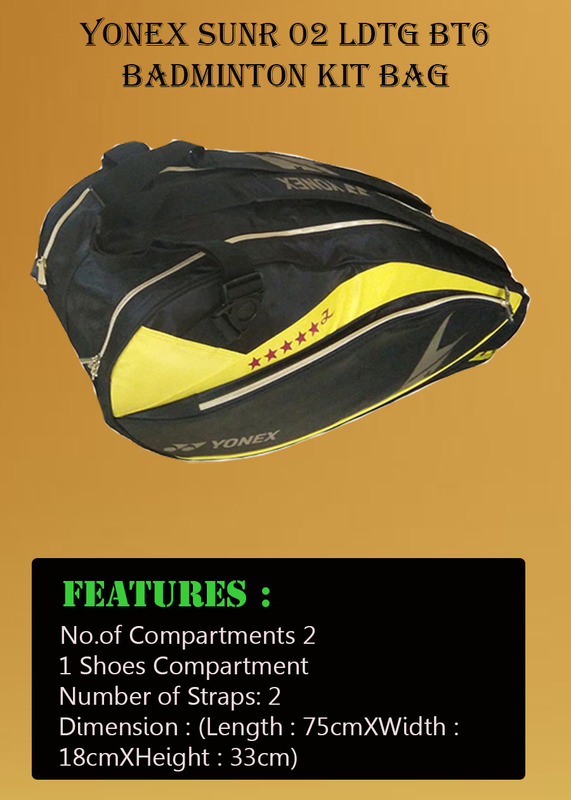 The 3 large foam lined compartments have been designed to hold up to 9 racquets. The easily accessible storage compartment helps in storing extra grips, sweat bands and other accessories. This product also has a special compartment for storing shoes. It has been from polyester and has a size dimension of 75 x 18 x 33 cm. 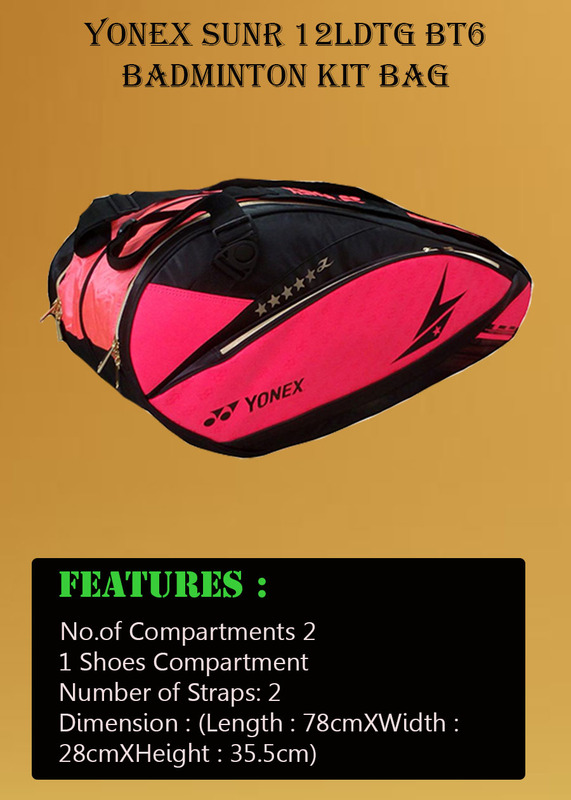 YONEX SUNR 12LDTG BT6 Badminton Kitbag is a large size kitbag consists of 2 compartments, 1 shoe compartment, 2 Strap. SUNR 12LDTG BT6 is made of 100 % polyester material with inside YONEX. 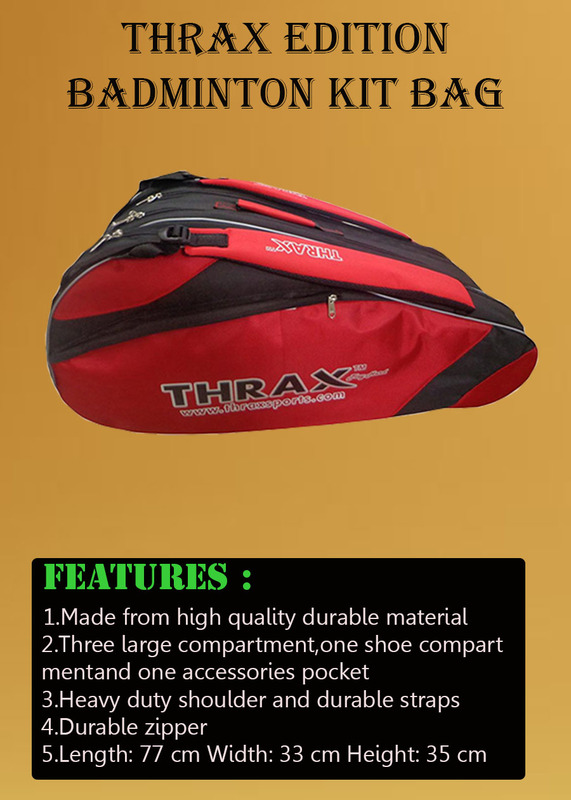 This is an all weather water resistance kit bag available in trendy colors. Bag is available in two colors –Black and Bright Red. 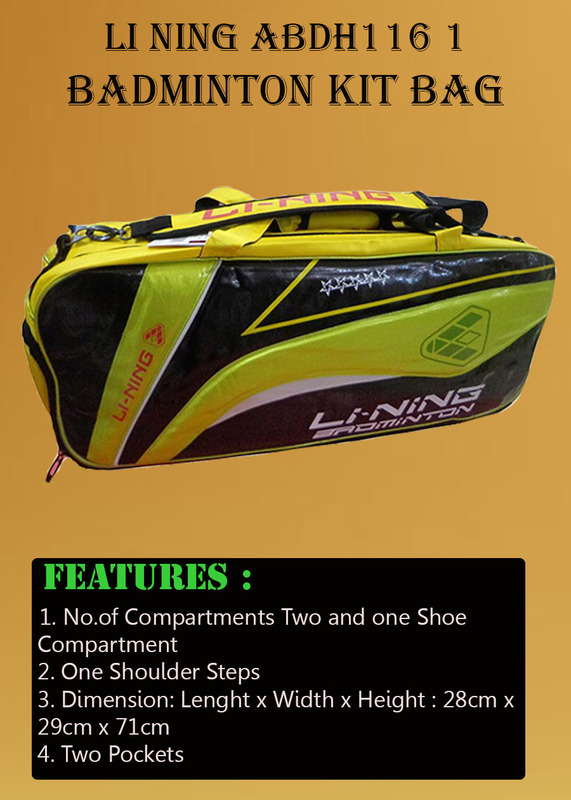 Li Ning ABDH116 4 Badminton Kitbag is a large size kitbag consists of 2 compartments, 1 shoe compartment, 2 Pocket and 1 Step. ABDH116 1 is made of 100 % polyester material with inside lining. This is an all weather water resistance kit bag available in trendy colors. Bag is available in two colors –Black and Yellow. Carlton has long understood the varying requirements of individual badminton players. 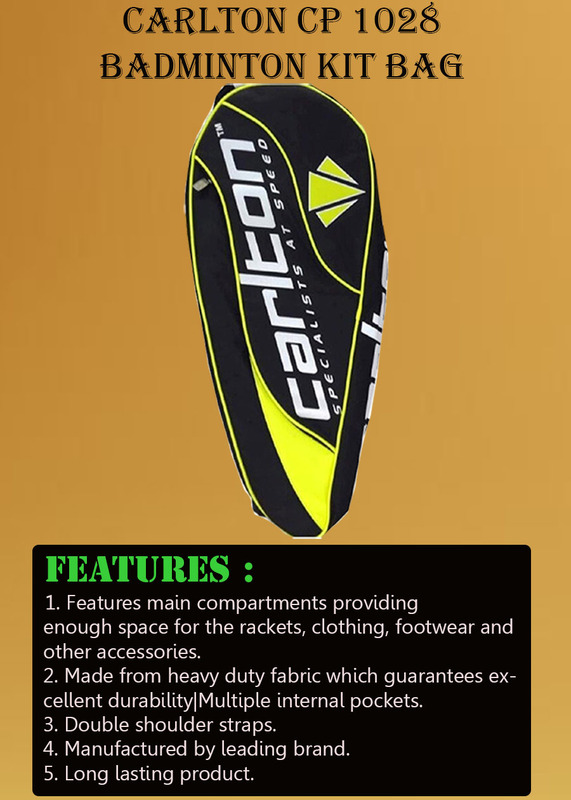 Using this extensive knowledge and expertise, in 2009, Carlton introduced the Carlton Badminton System. Comprised of a number of key components, this systemic approach to badminton equipment manufacture delivers scientifically validated improvements to your play ensuring you are a game ahead of the opposition. Snapdeal proudly presents another fine creation by Carlton for you. Victor Brave Sword Racket Series are most popular in complete Victor Series of rackets. Brave sword are basically designed for attacking players who wants to utilizes the power of racket in order to generate more speed in smashes. Victor Brave Sword 1700 Badminton Racquets is a head heavy racket with flexible shaft which offer combination of power and control. Racket is Equipped with aero dynamic shape which offer less air resistance and give more stability. The diamond shaped design cuts the air reducing the resistance. The isometric head provides a large surface area for the shots and distributes equal amount of force across the frame. These racquets have a moderate string tension of 20-22lbs and a standard length of 675mm. They are suitable for intermediate as well as experienced players. Since these racquets have G5 grip, there is ample amount of space to hold onto it. Victor Brave Sword 1700 is suitable for attacking player with intermediate playing style. 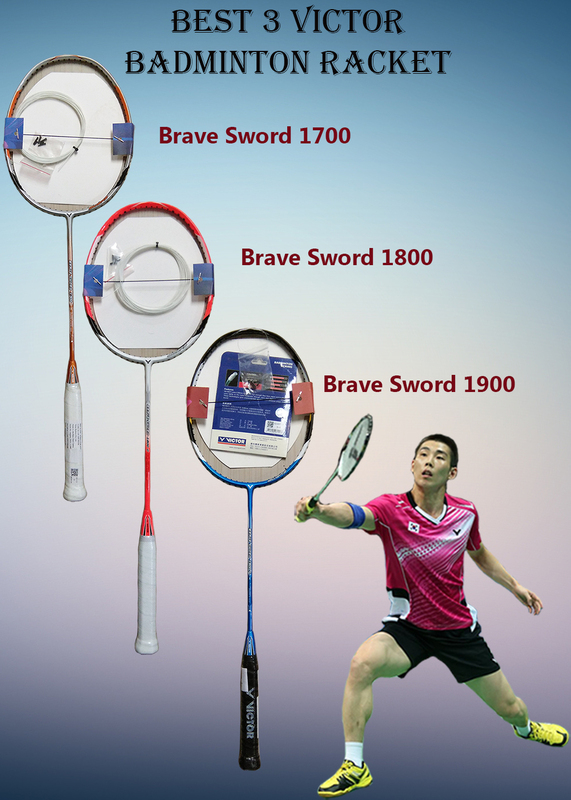 The Victor Brave Sword 1800 Badminton Racket is a great introduction to the Brave Sword Line of rackets. This racket is designed for beginners and intermediate and is available at a lower price point so that players can get to try the elegance, and stability of a Victor Brave Sword Racket. This racket is made from graphite material, with a 20-22 lbs string tension, which adds strength to your shots. 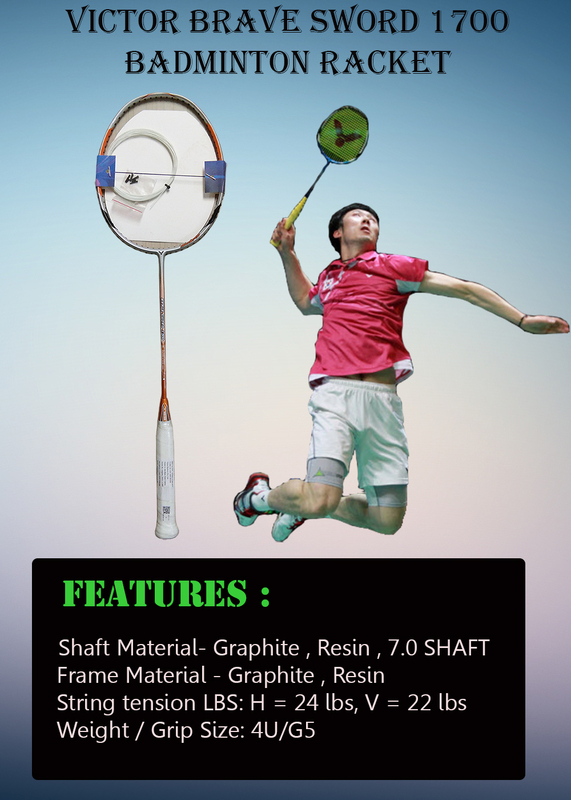 Racket is suitable for advance and professional players. Also, it is made of high-quality and long-lasting materials, to make it sturdy and provide more resistance. The firm right hand grip does not get separated easily, hence, provides a comfortable grip. The bright blue colour of the frame and black grip adds to the sporty yet stylish look of this unisex badminton racquet. This 675 mm long badminton racquet falls under the standard length category and it enhances the flexibility of the shots. Li Ning VIVO badminton shoes are latest model launched by LI Ning in Year 2017. 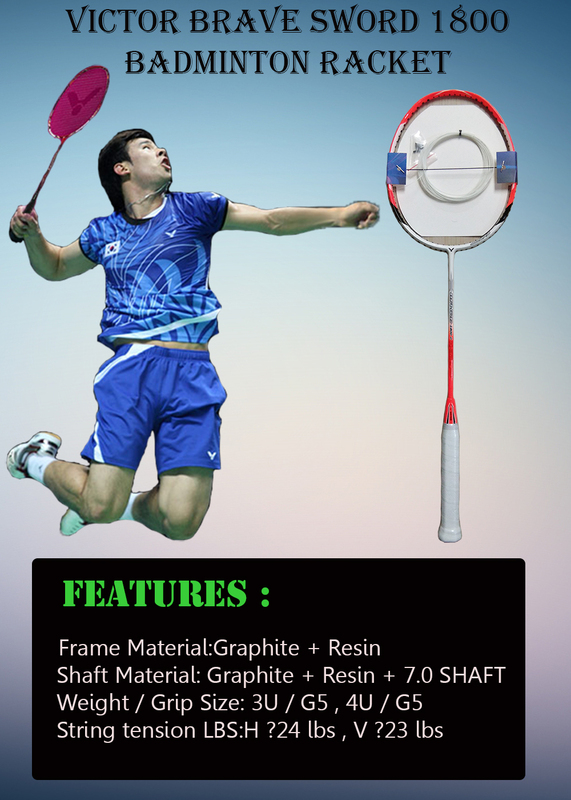 This model in developed for advance to intermediate badminton Players with lots of new and updated technology. Shoe design is very elegant and graphics are very artistically presented on shoe upper material. This models in available in 3 different variants (All Three variants are available on Khelmart.com). 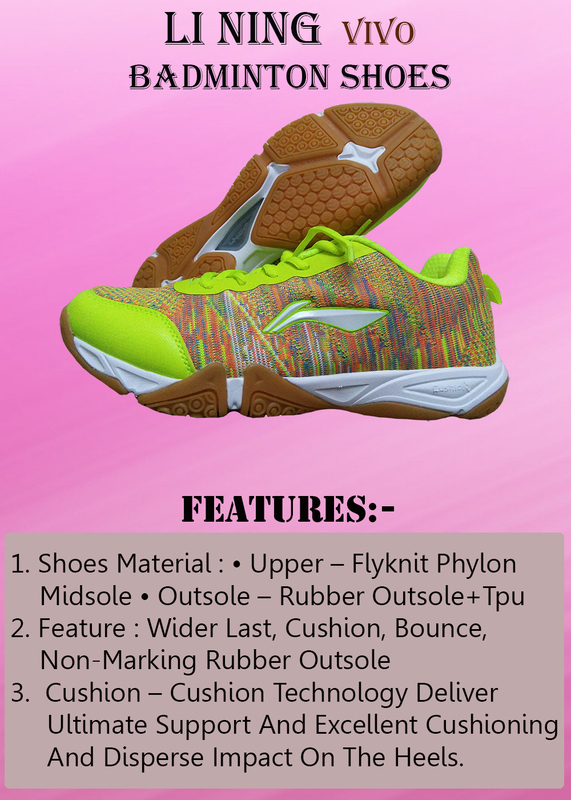 Shoe technology and its material will defiantly improve the player performance and with Li Ning brand Footwear, player can be assured on its durability. First variant in available in Multi base color while on top of that Lime color graphics give a different look to shoes. Shoe upper material is Fly knit Phylon is provide for proper air circulation for better feel and comfort during long game play. Mid sole is made of Outsole – Rubber Outsole+Tpu which is a very good shock absorbing material. Phylon sole along with super power cushion will provide an integrated bur flexible unit. Outer sole material is 100% rubber with unique groves patterns. In this shoe, base color is black while orange color Fly knit upper give new and attractive look to shoe. Fly knit upper also helps in providing better air circulation. Black upper PU with D7 grains gives better finishing and overall sporty look to shoe. Its thirds variant base color is blue while on background Lime color Fly knit upper is provide. Overall, Li Ning VIVO is a good and attractive looking shoe with all new and improved features. Players with advance playing skill will defiantly get advantage of this shoe and it will complement the player overall performance. Its design and shape with help in proper fitting. Advance super cushion system will help in better comfort and avoid injuries during intense game rallies while unique grip patter help in better traction force which eventfully result into effective court covering.